WILLEMSTAD - The government of Curacao denies that a collision with the Netherlands is imminent or that there is a need for any confrontation with the European kingdom partner. Reports suggesting otherwise are biased and may be motivated by the need to place the recently installed government in a bad light. The fact that the Cabinet has decided, in accordance with the wishes of the majority in Parliament, to suspend the elections has nothing to do with the relationship with the Netherlands. 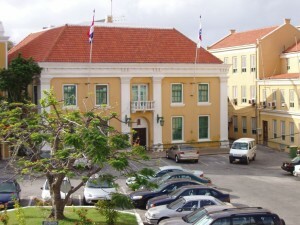 After all, as the Dutch Minister of Kingdom Relations Ronald Plasterk wrote to the Dutch Parliament on February 13, the organization of elections is an internal matter and that it is in the interests of Curaçao that on short time a stable government is installed.” This stable government took office on Friday and there is no reason to believe that there is an imminent confrontation with the Netherlands. It has become known that a majority of the members of Parliament has filed a case before the European Court of Human Rights in Strasbourg. That case was registered under No. 23105/17. Given the continuation of the elections will cause an irreparable situation that would make it a meaningless action before the Court, the government, therefore felt obliged to take the necessary measures to prevent it. The suspension of the elections, pending the appeal to the Court, therefore, has nothing to do with any confrontation with the Netherlands but seeks to comply with Article 34, the second sentence of the ECHR. The government therefore intends to ask the Foreign Ministry to notify the Court that the elections were suspended in compliance with that provision. That is why the on Friday appointed Cabinet believes that the Governor will have no problem to sign the national decree in question.